What we call sugar ants are actually Pharaoh, Pavement, or little black ants. Sugar ants get their name because they are primarily attracted to sweet foods, however they do feed on breads and fatty foods as well. The best extermination plan includes a combination of homemade traps and repellents. When you treat with dusts or sprays you only force them to spread to other areas of your home. How to get rid of sugar ants for good? You want to eradicate them completely using a combination of the traps and repellents below. The most effective way to get rid of sugar ants is to combine baits and repellents. Learn how. Borax is a mineral mined in the deserts of California that is very poisonous to household ants and non-toxic to humans (you should avoid inhaling or ingesting large amounts of borax). Borax can be found in the laundry aisle of most stores. It is a slow-acting poison, making it easy to mix with sweet baits so the ants to take the bait back to their colony and spread. Sugar ants are small and ravenous scavengers making them the easiest to exterminate with borax. Just mix some borax with sugar to create a jelly-like consistency. They'll carry this bait to their colony, which will kill them. Boric acid is another non-toxic chemical that you can mix with sweets to create baits for ants that can exterminate whole colonies. Boric acid can be purchased at any hardware store. When you mix boric acid with mint jelly or any other sweet item such as maple syrup, honey, or peanut butter you can create bait and traps that will exterminate whole colonies of sugar ants. How to make the bait: Create a bait using 2 tablespoons of boric acid and 8 ounces of mint jelly (or other sweet item) to create a mixture and store in a squeezable container or jar with a lid. Squeeze about 2 inches of the mixture on strip of masking tape that you have placed where you notice the ants. The ants will take the bait back to their colony. Instead of placing it on a piece of tape, create a trap so that you can keep your indoor animals safe. Place the mixture on a cracker. Put the cracker inside a small box with pinholes. Some of the ants may be killed in the box, but some will take it back to their colony. Putting the trap out at night will be more successful because that is when ants do most of their hunting. Whole cloves are used to repel a variety of unwanted insects including sugar ants. Ants do not like the smell of cloves so use them in the places you see the most traffic such as along baseboards, and under counters. Not only will you repel the ants but your home will smell nice too. Similar to cloves, bay leaves will help keep sugar ants away. Place bay leaves in cracks, under windows and under counters where you prepare foods. You can also wrap some bay leaves in cheese cloth and place them in kitchen drawers and cupboards. Rinse out any dishes that may have to wait until morning. When you finish washing dishes make sure you wash out the sink and run the garbage disposal. It is also a good idea to run white vinegar down the disposal to keep it clean as well. Many people neglect to vacuum their carpeted floors as well. 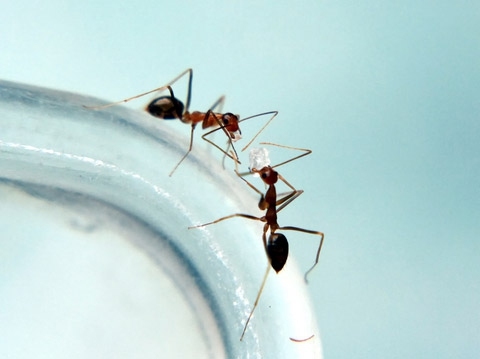 Sugar ants love crumbs of all foods, not just sweets. So, you need to be sure that you are proactive about cleaning up the crumbs that you may not see. When trash bags get punctured they can leave a trail of crumbs and drippings that the ants are sure to find. It is also a good idea to wash out the trashcan with a solution of vinegar and water. The acetic acid that is in vinegar is not only a great deodorizer, but it is one of nature’s best cleaning agents. Using vinegar instead of bleach is one of the best ways to naturally prevent sugar ants, but be sure to use white vinegar and not a sweet vinegar like apple cider vinegar. Use a 1:1 mixture of vinegar and water to wash off your counter tops. If you want something stronger, you can use a bleach based cleaner to break down the pheromones that the ants leave behind as well. Just as with your counters it is important that you mop your floor with a vinegar and water mixture as well. Be sure to sweep in all the nooks and crannies before you mop. You can also sprinkle baking soda or spray a mixture of baking soda and water on your carpets, counters and floors to help get rid of sugar ants. Combining this alternative with one or two of the tips above you will have a home free of sugar ant infestations. You may have mastered how to rid of the sugar ants inside, but unless you control the ones that are outside they will return to your home. There are several natural ways to control the ants outside as well. Instead of throwing away all those coffee grounds, make good use of them. Spread your used coffee grounds around the foundation of your home, under windows near the kitchen, or places where you have noticed an ant trail. Not only will you repel the ants, but any cats outside will avoid using the area to relieve themselves because they do not like the smell. Mint repels ants and other insects. Mint will spread quickly so plant some near the ant nests and they will soon be gone. You may also use chili pepper plants to get the same effect and repel termites as well. Be sure to use food grade DE and not pool grade DE. Food grade DE is naturally made and is non-toxic. You can also purchase it at a gardening store as well as being able to find it in many household products such as cake mixes and toothpaste. Microscopic silica in the DE actually cuts through the lipid layer in the ants causing them to dehydrate and die. Putting a ring around the foundation of your home or ant hills will kill off ants, cockroaches, ticks, mites, termites, and bed bugs.